A travel and lifestyle blog about Arizona, Spain, and everywhere in between. There’s some places you visit for the food—San Sebastián in the Basque Country comes to mind, with bars that are literally overflowing with tiny bites of pintxos—and then there’s others you visit for ancient ruins—think Arles in southern France with Roman amphitheaters and sewers. And there are other cities you spend time in for the architecture. Many of us live in a world of formulaic McMansions, soul-crushing strip malls, big box stores with 30-year shelf lives, and cold glass-and-steel office towers. We travel to cities with excellent architecture because these cities have a sense of place and because they remind us of the beauty in the world. I think this is one of the big draws Barcelona has on many visitors. Yes, the cozy medieval streets in the Gothic Quarter are nice and all, but the gridded Eixample district, where the city expanded around the turn of the century, is where Barcelona really shines. 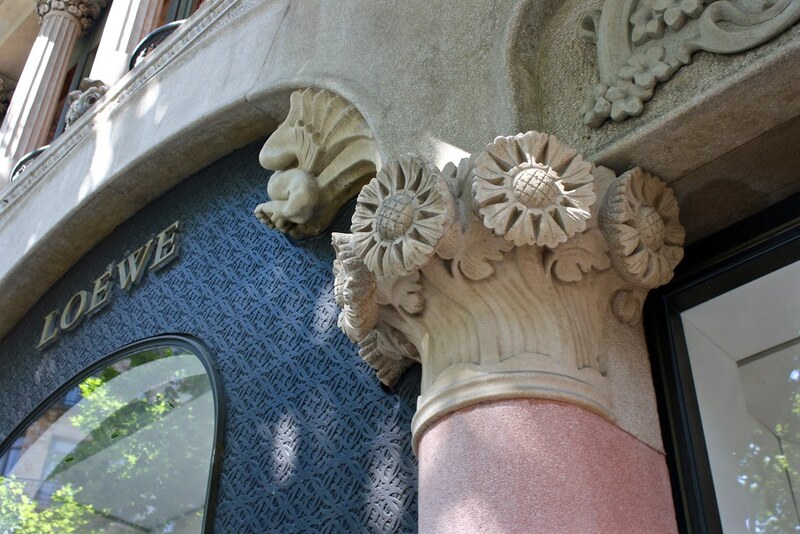 Grand apartment homes were constructed by the new Catalan middle class, many of whom contracted innovative architects who were trailblazing the modernista style of architecture, a distinctly Catalan form of the prevailing Art Nouveau movement. Antoni Gaudí is the most well-known of these architects, having designed glamorous houses like the Palau Güell or Casa Batlló and his unfinished masterpiece, the Sagrada Família church. 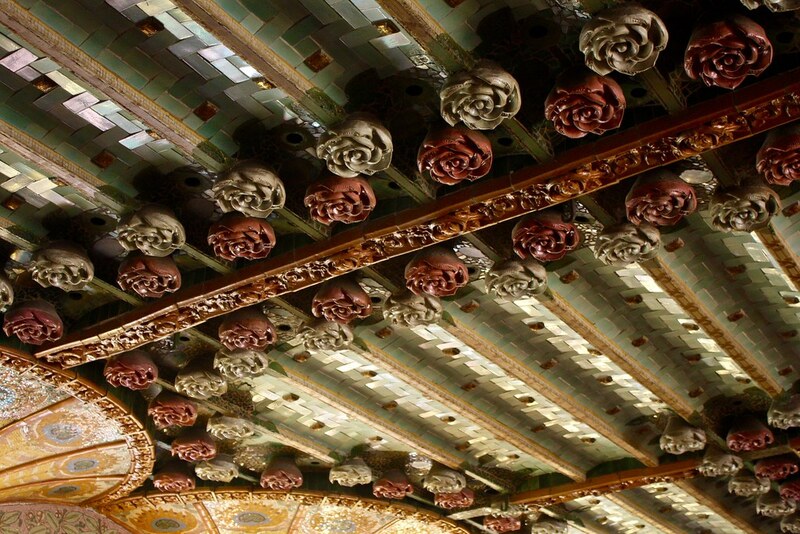 But Gaudí was far from the only architect active during this time period. 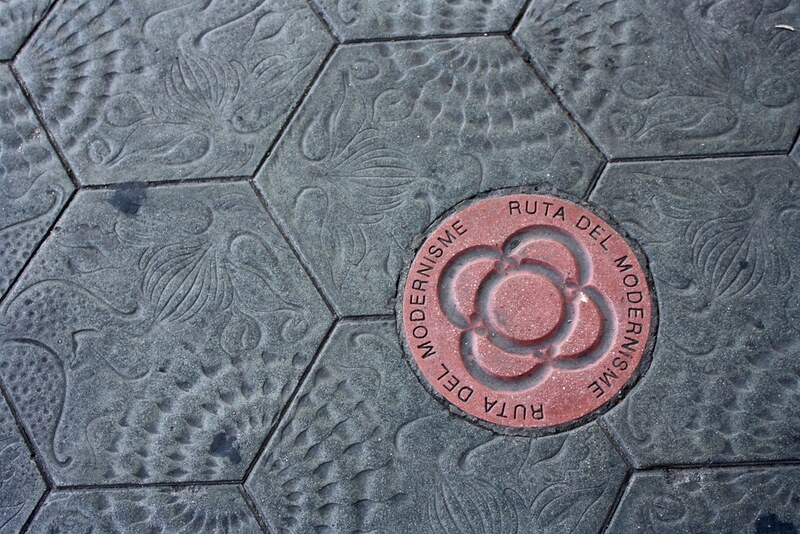 In fact, there’s so many Modernista-style buildings in Barcelona that the city government has put together a Ruta del Modernisme or Art Nouveau Walking Route that will take you past hidden gems that people all too often completely overlook as they seek out Gaudí’s work (I myself am guilty of this!). This itinerary forces you to walk down under-trafficked streets mere blocks from the tourist trail as you intentionally look for stops along the way. I spent a few hours on a refreshing Sunday morning in June doing just this and gained a deeper appreciation for the city’s architecture that goes so far beyond just Gaudí. 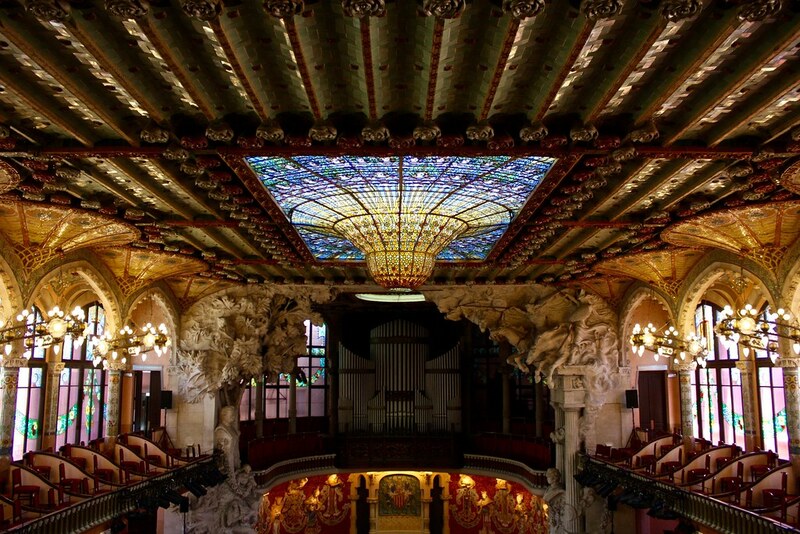 This concert hall dates from 1908 and was designed by Lluís Domènech i Montaner, an architect who deserves as much credit for pioneering the Modernista style as does Gaudí. The Orfeó Català had commissioned the building as a new space for choral music performances, so much of the interior is dripping with statues and decorations of singers and Muses. Now, the Palau is a thoroughly Modernista building, but to understand this style of architecture, you have to keep in mind the late-19th century context that it arose from. Although the Industrial Revolution almost completely bypassed Spain, it did make inroads in the northeast, in Catalunya, where textile mills flourished and a new middle class emerged. 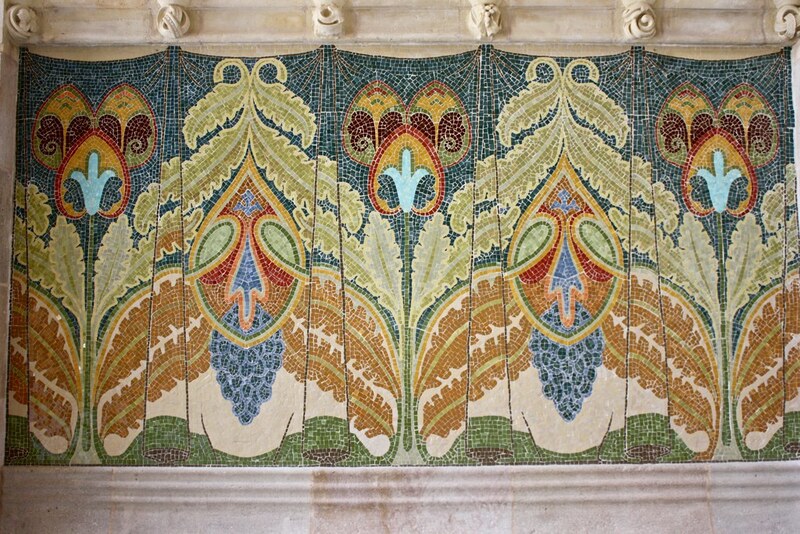 Art Nouveau was a reaction against industrialism; it countered mechanization, sharp lines, and general grayness with organic, flowing forms from the natural world and an exuberance of color and light. Many buildings you’ll find in Barcelona have no straight lines or 90º angles at all! The stained glass skylight is the dazzling centerpiece of the whole concert hall, and it allows matinée performances to be held exclusively with natural light. The sun seems to dip down in a parabolic gravity well, around which dozens of satellite-like female musicians revolve and sing the music of the spheres. It’s a really dazzling display of color and light and one of the most impressive things I’ve seen in the country. After the overwhelming beauty of the Palau, take a moment to follow the Catalan custom of fer el vermut, or going out for a pre-dinner drink of vermouth, the fortified, aromatized wine that was first introduced to Spain here in Catalunya. A great place to partake in this aperitif is Cala del Vermut (Carrer de les Magdalenes, 6), literally a hole in the wall with almost no seating. 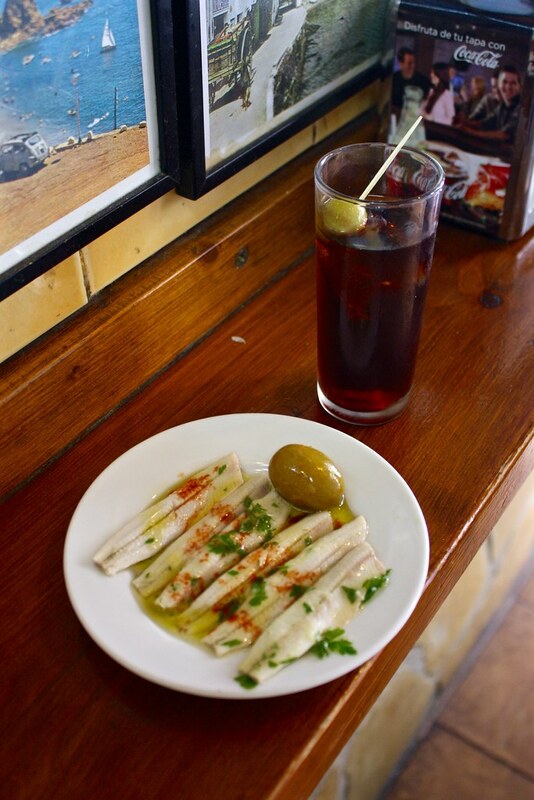 Order a glass of vermouth and a tapa of boquerones en vinagre—mild, vinegar-cured anchovies. Top off your short, caramel-colored drink with a splash of soda water, throw some dashes of paprika-spiced espinaler sauce on your anchovies, and enjoy the character of this standing-room-only bar. When I was here a friendly local struck up a conversation with me and ended up showing me on his cellphone photos he took of populist Ada Colau’s investiture ceremony as the city’s new mayor. 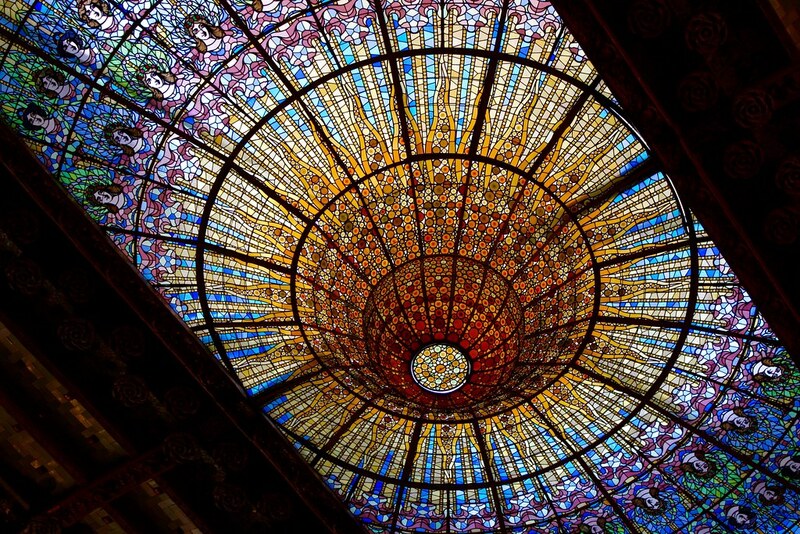 As you stroll north along the grand Passeig de Gràcia, don’t forget to look up…or down! 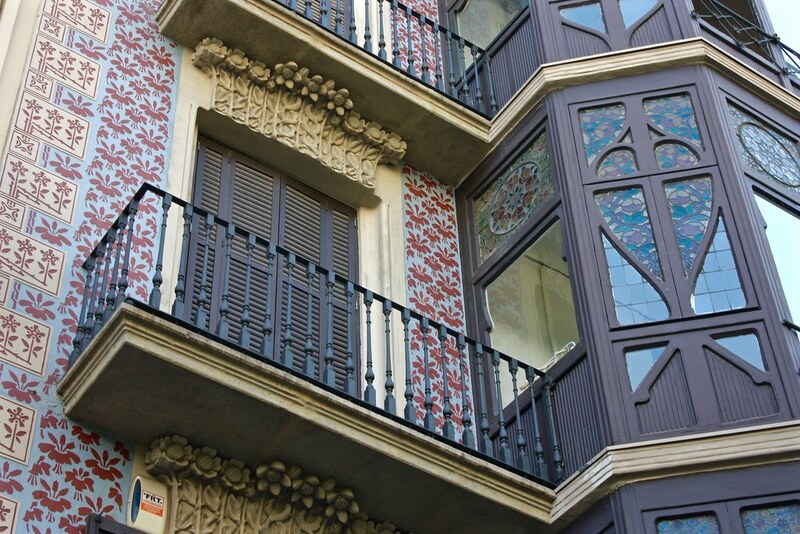 Pretty balconies and intricate façades are a real delight, while the swirling marine-inspired tiles that pave the sidewalks were designed by Gaudí himself. Look for inset clay-colored plaques to make sure you’re on the right path on this itinerary. The route that the city has laid out will take you back and forth across this main drag to quiet side-streets just one block away from busy intersections. A major highlight along the Passeig de Gràcia is the so-called mansana de la discòrdia, where several houses designed by major Catalan architects vie for attention. 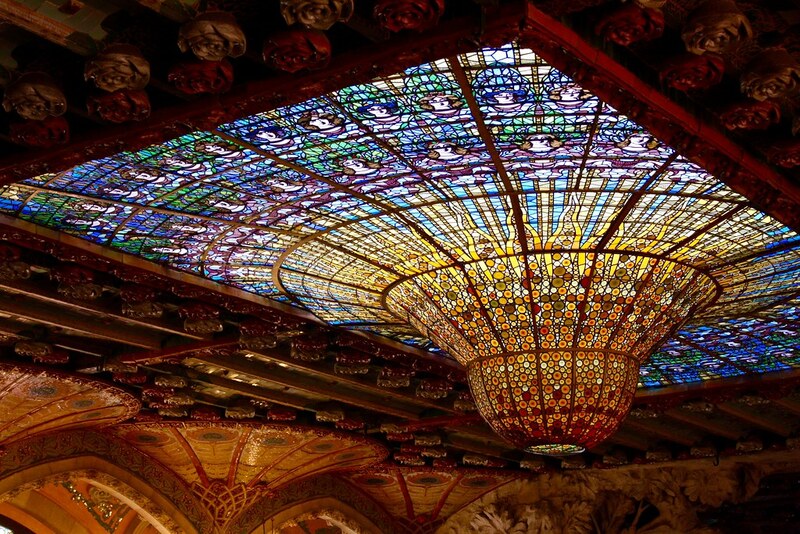 The most famous of these is, of course, Gaudí’s Casa Batlló, but literally right next door is Casa Amatller, designed by Josep Puig i Cadafalch. During my first visit to Barcelona I was so distracted by Casa Batlló that I completely ignored its neighbor, but Casa Amatller juxtaposes with it wonderfully and its Dutch-style stairstep roof is a playful contrast with Casa Batlló’s serpentine, iridescent roof. 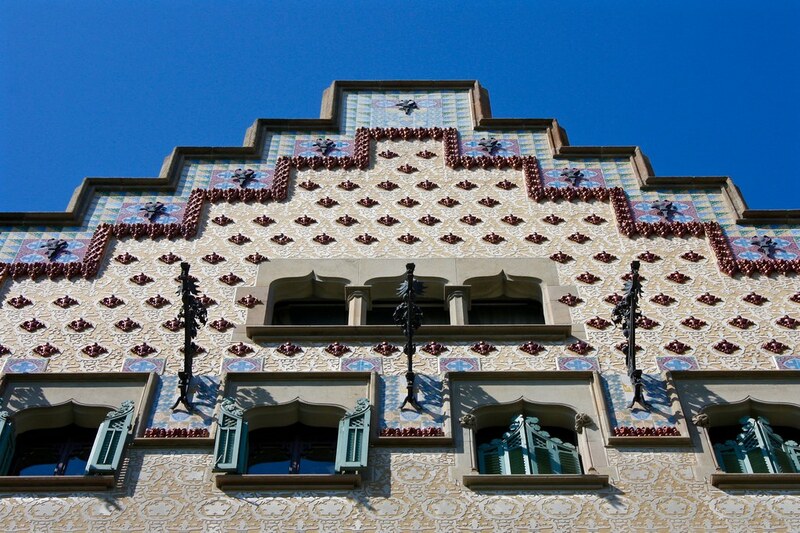 Casa Lleó i Morera, a stone’s throw to the south, is another gorgeous work by Domènech i Montaner. This house incorporates organic elements from nature like sculpted lions or motifs of a mulberry tree that play off of the name of the family who lived here. You’ll likely have worked up an appetite by the time you reach the northern edge of the Eixample neighborhood, so check out Entrepanes Díaz, a sandwich shop that exclusively hires experienced waiters over the age of 50. The name itself is a cheeky play on words with the Catalan word for “sandwiches”—entrepáns—but rendered in Castilian form, as the interior is modeled after a traditional Madrid-style restaurant. 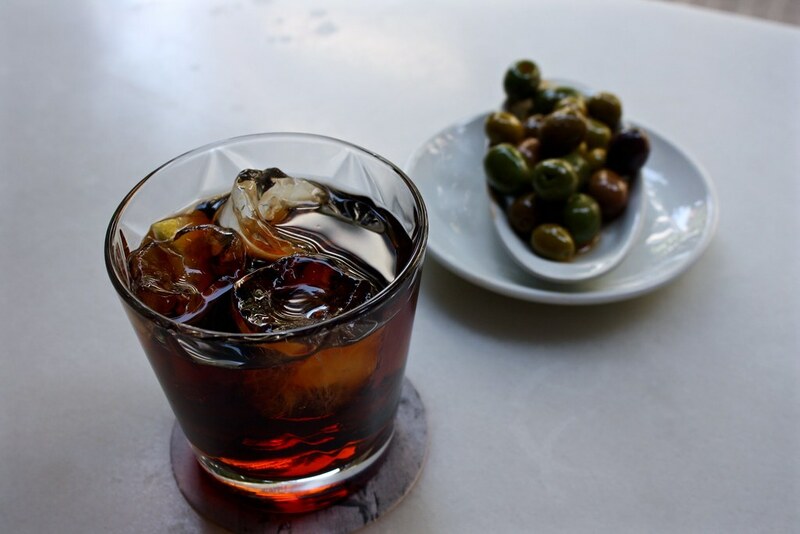 You can’t go wrong with an iced vermouth, a dish of olives, and a tiny sandwich of Jaén-style blood sausage or fried fish. When my server from Oviedo learned that I was living in Galicia at the time of my visit, he and I bonded over the weather and culture of northern Spain…all at a very un-Catalan place. Nearby you can check out Casa Terrades, which also goes by the nickname Casa de les Punxes or “the pointy house” for the sharp, conical roofs that crown the house. Designed by the same guy who did Casa Amatller (Puig i Cadafalch), Casa Terrades is one of the newest Modernista homes now open to the public for visits. 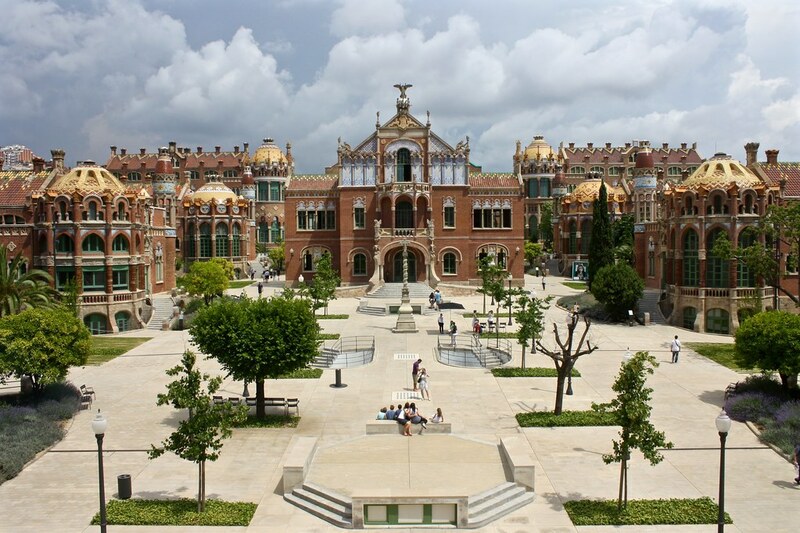 Bring your tour of non-Gaudí Art Nouveau in Barcelona to a close with a metro ride northeast to the Hospital de la Santa Creu i Sant Pau, or alternatively you could walk the fifteen or so blocks that separate this sprawling medical facility from the main tourist drag. So what is this final destination on the route? The “Hospital of the Holy Cross and St. Paul” is one of Europe’s oldest hospitals (still going strong after 600 years!) 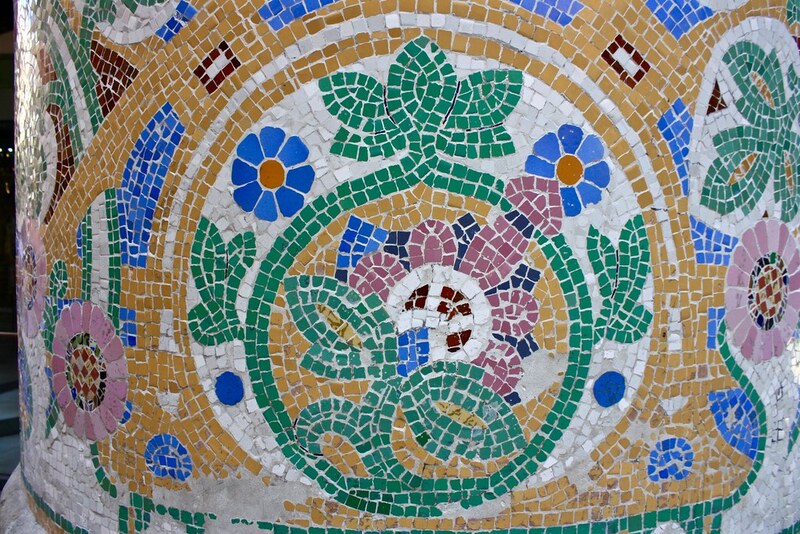 but its current location, which takes up nine city blocks, also contains the world’s largest Art Nouveau site: 18 brick pavilions dressed to the nines in colorful tile mosaics. This sprawling complex often gets overshadowed by the Sagrada Família—almost literally, as you can make a beeline for Gaudí’s unfinished temple from here along the Avendia de Gaudí—but this is a shame, as the de-commissioned buildings and pleasant grounds that surround them are a lovely escape from the tourist madness mere blocks to the south. The actual day-to-day operations of the hospital now go on in state-of-the-art buildings to the north of the original site. Because of this, many of the original pavilions have been restored and are now used as offices for charities or non-profits, but other pavilions are falling apart and in dire need of repair. Nevertheless, the relaxing surroundings present a truly healing landscape full of lavender, sage, and citrus trees. The administration building is the finale of the visit: this vast, towering hall incorporates neo-Gothic arches, vaults, and trefoils, but adds a healthy smattering of Modernista embellishment, such as floral-painted tiles, that could only have been done in the Industrial era: the sheer quantities of bricks, tile, and glass were made possible by the same Industrial Revolution that the Modernista movement was a reaction against. As I type here on my MacBook Air and fondly remember Barcelona’s stunning architectural heritage, I am grateful for both. 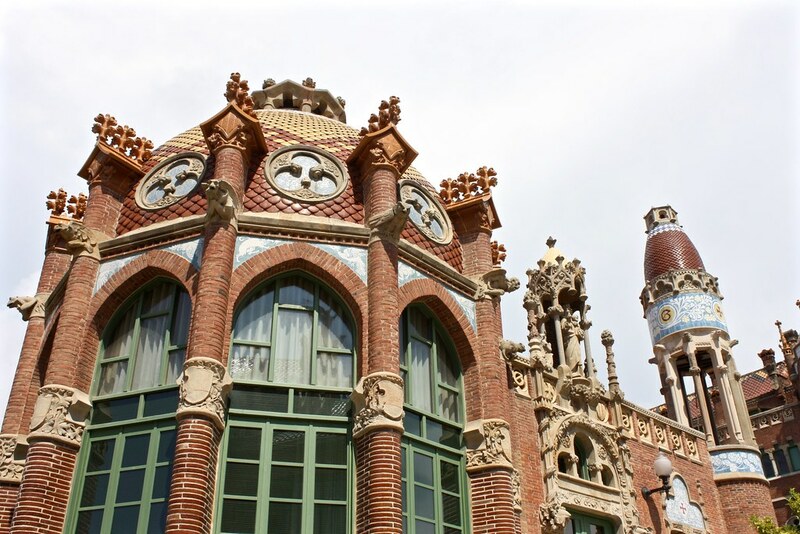 Are you a fan of Art Nouveau architecture—be it by Guadí or others? Share your feelings about this unique and trailblazing movement below in the discussion thread! Read my Galician crash course here to get up to speed in the language. Galician is a Romance language (i.e., from Latin) spoken by about 3 million people in Spain’s northwestern region of Galicia. Although it’s most closely related to Portuguese—which is spoken south of the border—it shares many similarities with Castilian Spanish, including sounds and spelling. If you’re planning on spending any time traveling or living in this unique corner of Spain, or walking the Camino de Santiago pilgrimage route that ends here, even a tiny knowledge of Galician will help you get around and navigate menus, maps, etc. If you happen to speak Spanish, you’re already 80% of the way to understanding Galician, and I’m serious! Getting a grasp on the grammatical and phonological differences will turbo boost you up to 90%. My breath condensed into a steamy vapor in front of my face, a rare sight in Phoenix. I wasn’t ready for 40 degrees in early October, and the lone Patagonia puff jacket I had packed was barely enough to keep me warm as I walked on sidewalks strewn with glossy, wet leaves. Thankfully, the heater was on full blast at the Georgia O’Keefe Museum. I’ve been a huge fan of this New Mexican artist ever since my high school art teacher first exposed me to her work. When I moved to Phoenix three years ago and finally saw some of her paintings hanging in the Phoenix Art Museum, I decided I had to go on a pilgrimage to Santa Fe to her eponymous museum. If you’re like me, you’ve probably learned Spanish as it’s spoken throughout Latin America. Now, I know there is no one single standard Latin American accent, but there are a few things I’ve noticed when listening to Spaniards speak that distinguish them from Spanish speakers in, for example, Nicaragua or Argentina. Since living here for the greater part of a year, I’ve both consciously resisted and unconsciously picked up on many features of the typical Spanish accent. After thinking about it for a while, I’ve decided there are around five characteristics that most distinguish the Spanish of Spain from the Spanish of the Americas. These five sounds, when spoken in the Castilian way, will bring you much closer to sounding native.